Users of the free email client Mozilla Thunderbird have just as much reason to make regular backup copies of their messages, settings, and user profiles as anyone else. If you've ever struggled to back up these items with Microsoft Outlook or Outlook Express, you'll be surprised at how easy backups are in Thunderbird. It's a good idea to backup your email, to protect yourself from a hard drive disaster, or if you want to move your email setup to a new computer. Ubuntu Linux: Click the Places menu on the main screen and select Home Folder. In the File Browser window that opens, click View and check Show Hidden Files. Double-click the .thunderbird folder. Your profile folder's name consists of two parts. First, there is a string of random characters generated by Thunderbird, followed by the profile name that you choose. The two parts are separated by a period, i.e., d7f5e9x7.myprofile. If you did not choose a profile name, the name defaults to something like d7f5e9x7.default. To minimize the size of your backup, I recommend that you first compact your email folders, and empty the Trash folder. Click File > Compact Folders or File > Empty Trash to perform those steps. To back up Thunderbird, simply copy your profile folder to a backup location. You can copy it to a flash drive, an external hard drive, or burn it to a CD disk. That's it, you're done! If you have multiple user profiles set up, you can copy each profile folder to the backup location. 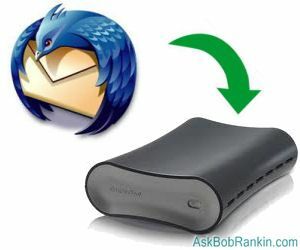 There is an even easier way to back up Thunderbird profiles, and Firefox profiles too. MozBackup is a free utility written by Pavel Cvrcek that automatically backs up user profiles of these and other products in the Mozilla lineup. However, it works only under Windows. If you've experienced a hard drive failure, or you want to move your Thunderbird environment to another computer, it's as simple as copying all the files from your backup folder to the profile folder. If you've just installed Thunderbird on a new computer, open the profile folder and delete everything in it before copying the files from your backup. Most recent comments on "How To Backup Thunderbird"
I can't get this file to open anywhere.Where do I go after c/p the above link? EDITOR'S NOTE: Sorry, the formatting got messed up. See the corrected text above. KLS Mail Backup is also an easy to use backup program that allows you to back up and restore your Windows Mail, Outlook Express, Mozilla Thunderbird, Firefox profile files. I made a backup of my Thunderbird mails before a PC shop upgraded me from XP to Windows 7. I went back to them and showed that they hadn't reinstated all my mail. It appears that backups of Mozilla products done in XP can only be restored to XP and W7 can't read the backup! Is this idiocy on their part or idiocy on Microsoft's part? I use a free program called Mozbackup which will backup Firefox and Thunderbird. You can choose what to backup, including any extensions, address book(s) and plugins. Please start dating your posts.